In the early days (okay a few years ago), Gartner analysts believed that marketing would be entirely driven by analytics by 2018. This hasn’t happened at all, and in fact, measuring the value of a brand remains a struggle for marketers today. Gartner analysts provided a lot of insight around the issue but of course there is no magic bullet because there is no standardization in brand measurement either. Marketers typically approach metrics either from a business perspective, looking at metrics like sales lift and market share, or a consumer perspective, such as brand equity and customer experience metrics. 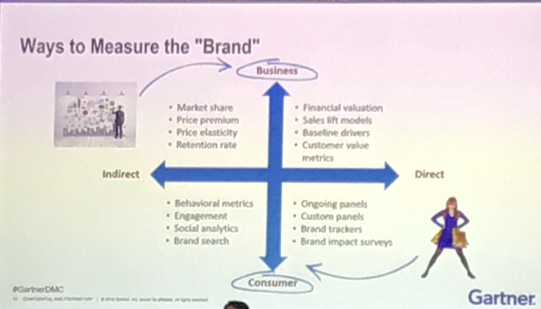 But marketers should look at a combination of metrics, such as brand health, customer engagement and customer experience to better understand and communicate a brand’s value to key stakeholders–and by all means, focus your executives on those metrics that are tied to results, not the fluffy stuff! After all, a brand equates anything that can be known publicly about a company. You may “sell” a product, but you represent a group of people who have emotional reactions to everything you do and say publicly, including the colors of your logo, and a well-measured brand looks at all of these facets. More than 20 years of experience building and executing global communications programs and managing relationships with the media, industry analysts & other influential communities.